This is a customer marketing database ppt powerpoint presentation pictures slide download cpb. This is a eight stage process. 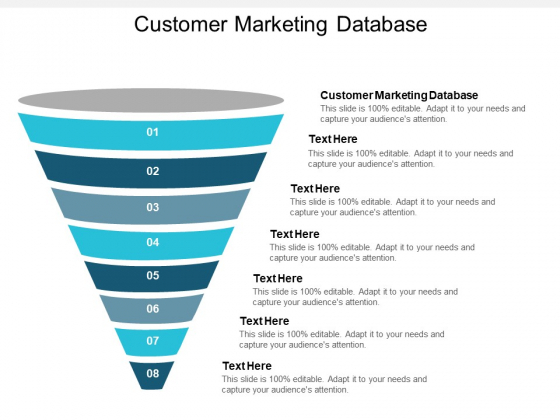 The stages in this process are customer marketing database. Demonstrate consistency with our Customer Marketing Database Ppt PowerPoint Presentation Pictures Slide Download Cpb. Ensure every effort is equally impressive. 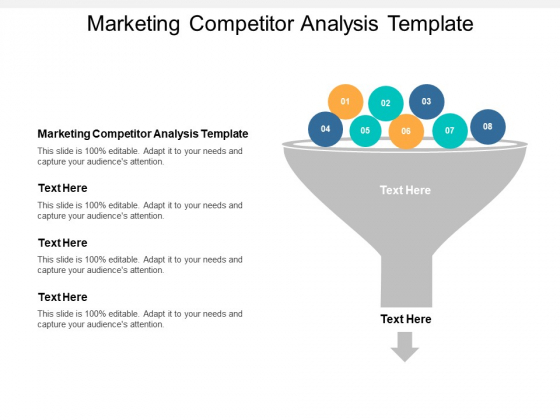 This is a marketing competitor analysis template ppt powerpoint presentation slides picture cpb. This is a eight stage process. The stages in this process are marketing competitor analysis template. Bring about a dialogue with our Marketing Competitor Analysis Template Ppt PowerPoint Presentation Slides Picture Cpb. Involve folks in a discussion. This is a marketing initiatives to increase sales product demos and webinars ppt powerpoint presentation ideas graphics. This is a eight stage process. The stages in this process are marketing effort, branding initiative, marketing initiatives. Ensure folks are fully informed about the alternatives with our Marketing Initiatives To Increase Sales Product Demos And Webinars Ppt PowerPoint Presentation Ideas Graphics. Enable them to decide on the correct course. 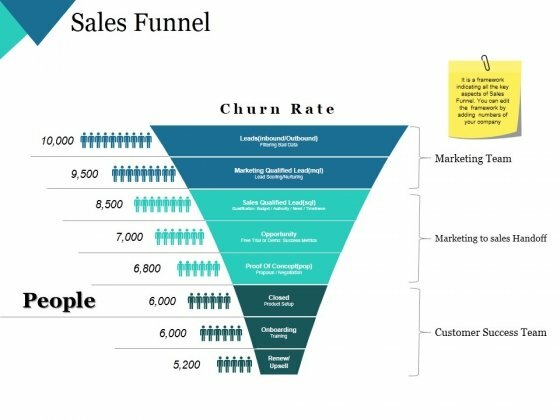 This is a sales funnel ppt powerpoint presentation portfolio deck. This is a eight stage process. The stages in this process are opportunity, proof of concept, closed, onboarding, renew upsell. Be a loyal citizen with our Sales Funnel Ppt PowerPoint Presentation Portfolio Deck. Do your bit for the good of the country. 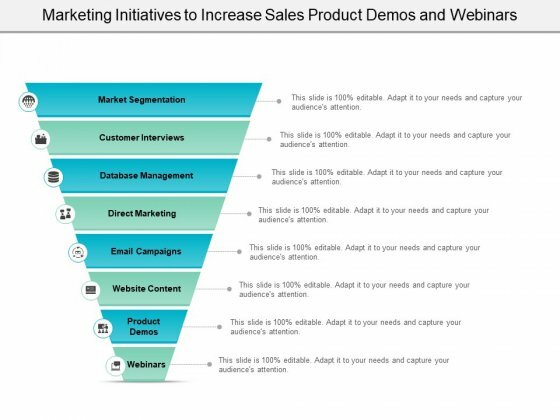 This is a sales funnel ppt powerpoint presentation layouts gridlines. This is a eight stage process. The stages in this process are marketing team, marketing to sales handoff, customer success team, closed, onboarding. Glorify the loyal with our Sales Funnel Ppt PowerPoint Presentation Layouts Gridlines. Hail deeds of devotion to the country. 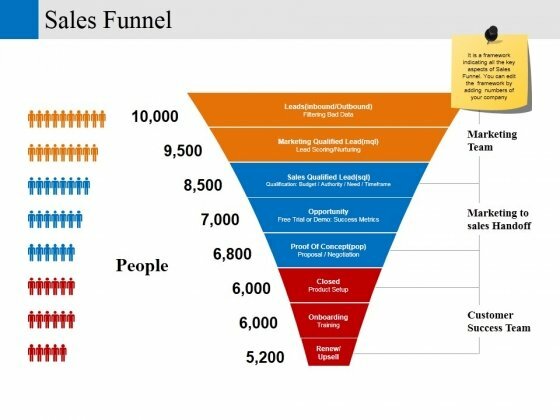 This is a sales funnel ppt powerpoint presentation show graphics. This is a eight stage process. The stages in this process are leads, marketing qualified lead, proof of concept, onboarding, renew. 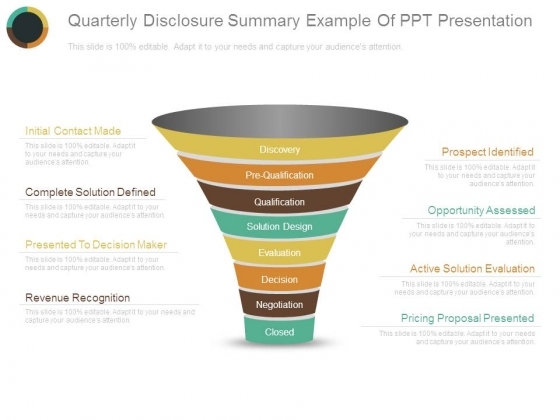 Involve folks in a discussion with our Sales Funnel Ppt PowerPoint Presentation Show Graphics. Be able to bring about a dialogue. This is a quarterly pipeline summary ppt powerpoint presentation layouts deck. This is a eight stage process. The stages in this process are discovery, qualification, solution design, evaluation, decision. Our Quarterly Pipeline Summary Ppt PowerPoint Presentation Layouts Deck enable you to have a fruitful discussion. Be able to enter into a dialogue. 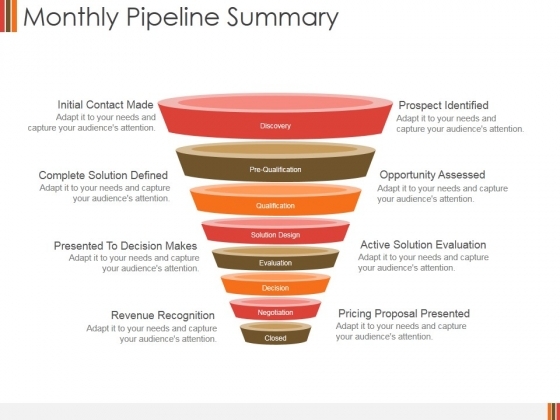 This is a monthly pipeline summary ppt powerpoint presentation infographic template elements. This is a eight stage process. The stages in this process are initial contact made, complete solution defined, presented to decision makes, revenue recognition, negotiation. 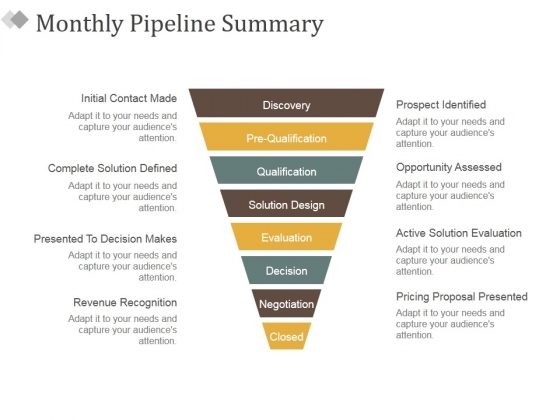 Deal a decisive blow with our Monthly Pipeline Summary Ppt PowerPoint Presentation Infographic Template Elements. Get clearlyahead in a critical event. This is a quarterly pipeline summary ppt powerpoint presentation pictures show. This is a eight stage process. The stages in this process are discovery, pre qualification, qualification, solution design, evaluation, decision. Make your presentations glow like the sun with our Quarterly Pipeline Summary Ppt PowerPoint Presentation Pictures Show. You will be at the top of your game. 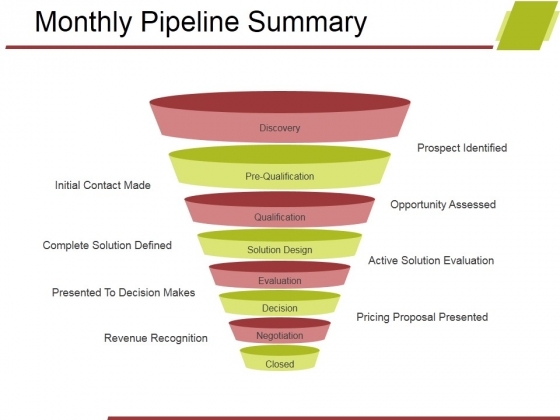 This is a monthly pipeline summary ppt powerpoint presentation portfolio graphics pictures. This is a eight stage process. The stages in this process are discovery, qualification, solution design, evaluation, decision. Exercise creativity with our Monthly Pipeline Summary Ppt PowerPoint Presentation Portfolio Graphics Pictures. You will come out on top. 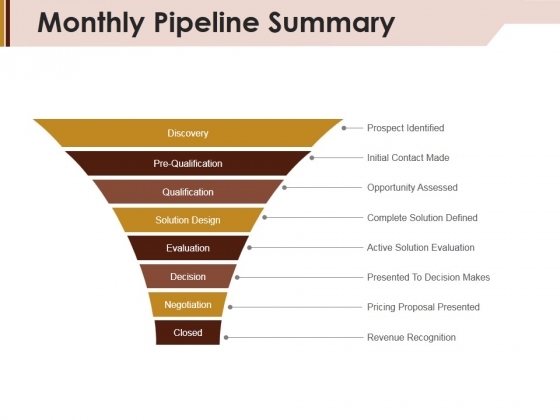 This is a monthly pipeline summary ppt powerpoint presentation pictures mockup. This is a eight stage process. The stages in this process are discovery, pre qualification, qualification, solution design, evaluation, decision, negotiation, closed. Locate problems with our Monthly Pipeline Summary Ppt PowerPoint Presentation Pictures Mockup. Download without worries with our money back guaranteee. 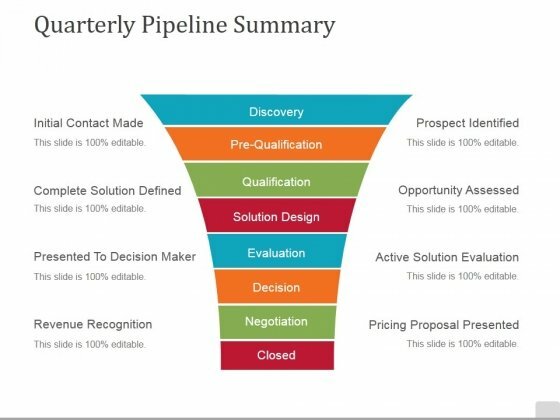 This is a monthly pipeline summary ppt powerpoint presentation model examples. This is a eight stage process. The stages in this process are discovery, pre qualification, qualification, solution design, evaluation, decision, negotiation, closed. Build a feeder line of our Monthly Pipeline Summary Ppt PowerPoint Presentation Model Examples. Your thoughts will roll along smoothly. 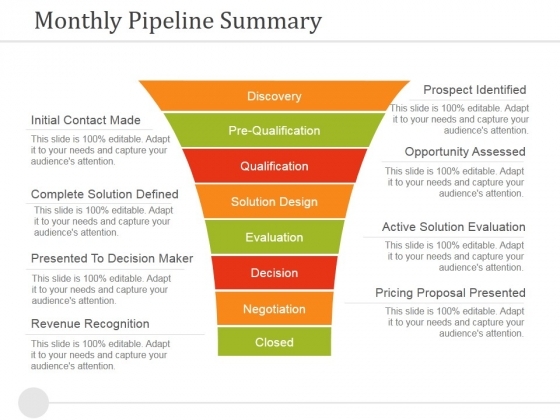 This is a monthly pipeline summary ppt powerpoint presentation infographic template examples. This is a eight stage process. The stages in this process are discovery, pre qualification, qualification, solution design, evaluation, decision, negotiation, closed. 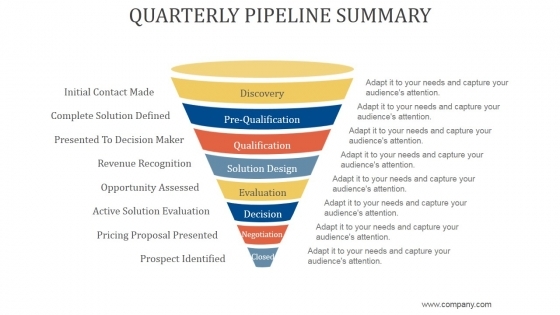 Our Monthly Pipeline Summary Ppt PowerPoint Presentation Infographic Template Examples have a far reaching effect. Your ideas will bring cheer to many. 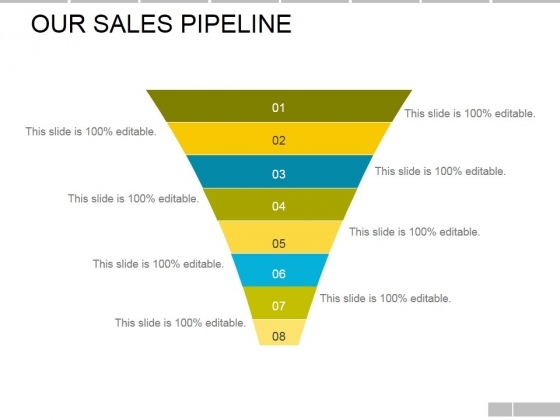 This is a our sales pipeline ppt powerpoint presentation infographic template slides. This is a eight stage process. 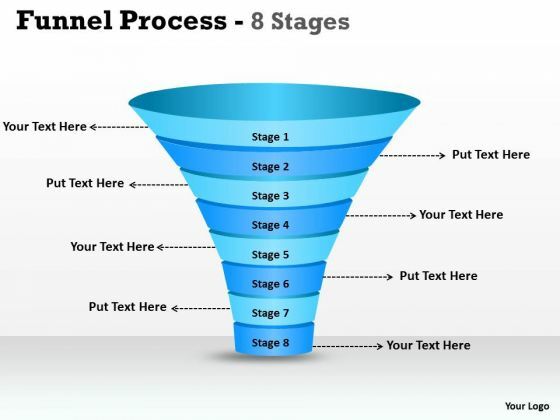 The stages in this process are funnel, flow, process, sales, business. Our Our Sales Pipeline Ppt PowerPoint Presentation Infographic Template Slides are good for any contest. They enjoy every challenge put to them. This is a quarterly pipeline summary ppt powerpoint presentation information. This is a eight stage process. The stages in this process are discovery, pre qualification, qualification, solution design, evaluation, decision, negotiation, closed. Our Quarterly Pipeline Summary Ppt PowerPoint Presentation Information will ensure you get an A. You will be glad you tried us out. 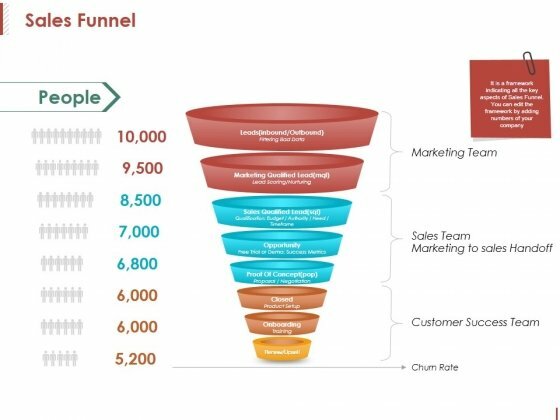 This is a lead generation funnel ppt slide examples. This is a eight stage process. 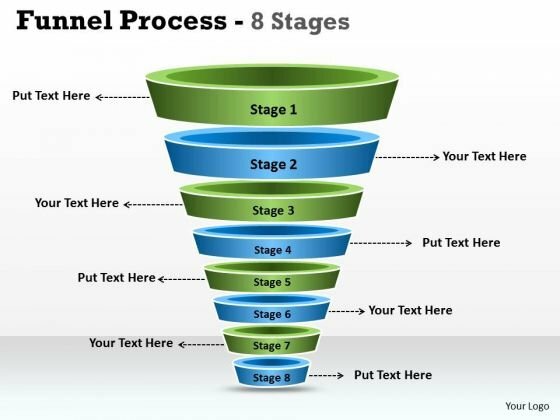 The stages in this process are business, flow, marketing, funnel, process. Bash on ahead with bold conviction. 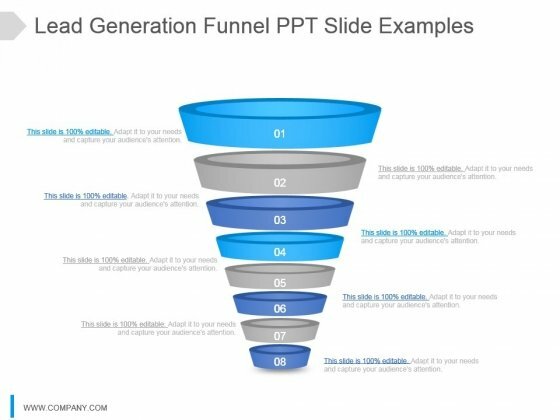 Have no fear with our Lead Generation Funnel Ppt Slide Examples. 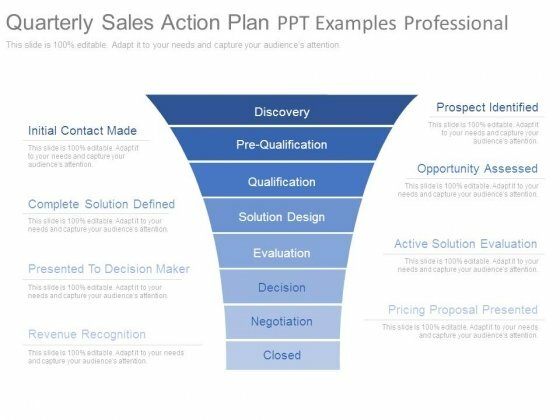 This is a sales deal steps funnel chart ppt templates. This is a eight stage process. The stages in this process are discovery, pre qualification, qualification, solution design, evaluation, decision, negotiation, closed. 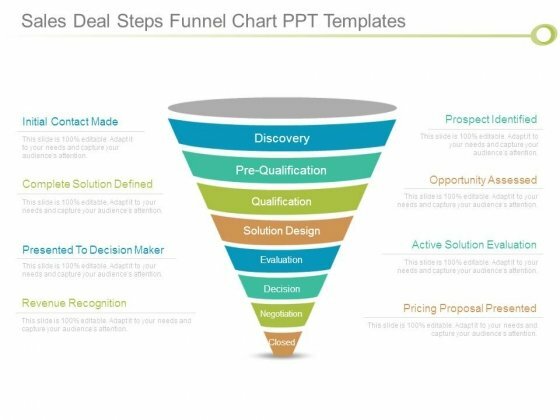 Our Sales Deal Steps Funnel Chart Ppt Templates will carry any burden. Be assured that they will take you far. This is a quarterly sales action plan ppt examples professional. This is a eight stage process. The stages in this process are discovery, pre qualification, qualification, solution design, evaluation, decision, negotiation, closed. Help them discover new faith with our Quarterly Sales Action Plan Ppt Examples Professional. Convert them to your line of thinking. This is a quarterly disclosure summary example of ppt presentation. This is a eight stage process. 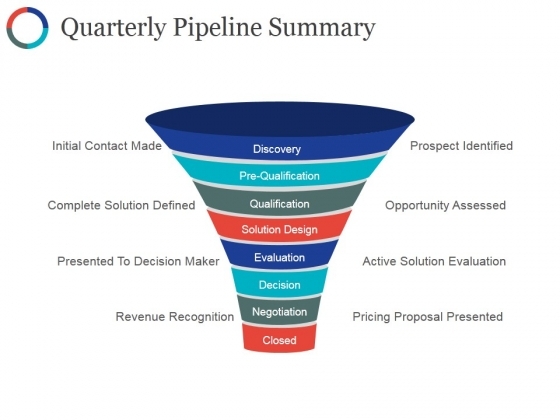 The stages in this process are initial contact made, complete solution defined, presented to decision maker, revenue recognition, prospect identified, opportunity assessed, active solution evaluation, pricing proposal presented, discovery, pre qualification, qualification, solution design, evaluation, decision, negotiation, closed. Advocate ecofrindly approaches in daily business. Encourage your employees with our Quarterly Disclosure Summary Example Of Ppt Presentation. 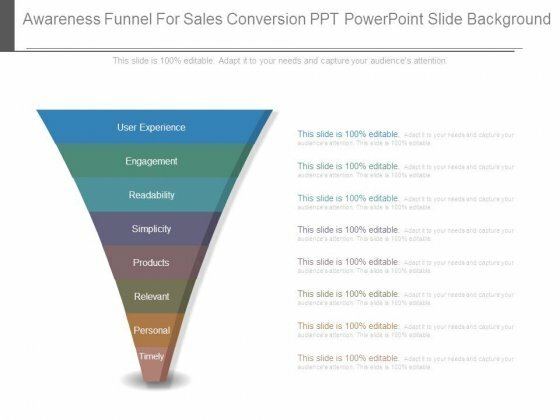 This is a awareness funnel for sales conversion ppt powerpoint slide background. This is a eight stage process. The stages in this process are timely, personal, relevant, products, simplicity, readability, engagement, user experience. 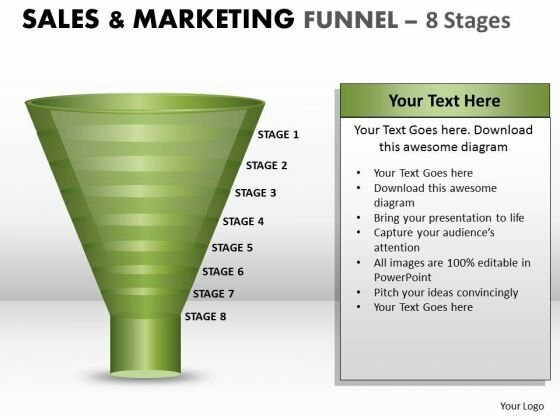 Sharpen your strategy with our Awareness Funnel For Sales Conversion Ppt Powerpoint Slide Background. You will come out on top. This is a new product development innovation example ppt presentation. This is a eight stage process. The stages in this process are new product strategy, idea generation, idea screening, business analysis, development, test marketing, commercialisation, new product. 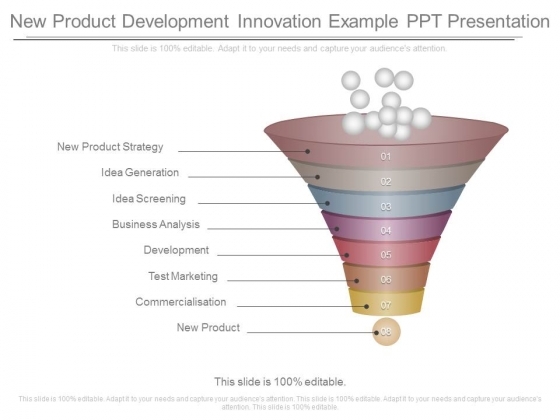 Position yourself with our New Product Development Innovation Example Ppt Presentation. Download without worries with our money back guaranteee. This is a vision mission goals objectives of leadership ppt slides. This is a eight stage process. The stages in this process are vision, core beliefs, core beliefs, impact, results, impact, mission, strategic objectives and goals, core impact areas, organizational structure, programs, projects, actions. 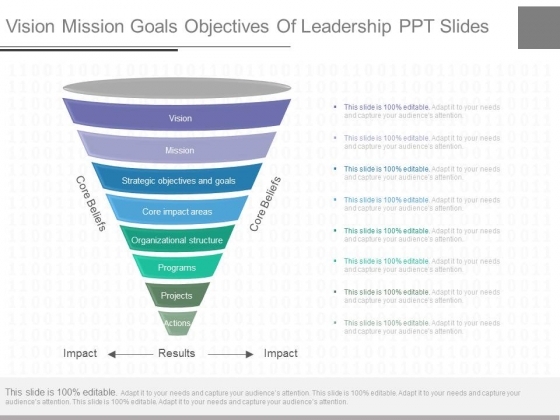 Satisfy your boss with our Vision Mission Goals Objectives Of Leadership Ppt Slides. Download without worries with our money back guaranteee. This is a enterprise marketing automation in crm diagram presentation ideas. This is a eight stage process. The stages in this process are raw leads, viable leads, nurtured leads, active leads, marketing qualified leads, sales accepted leads, opportunities, closed won. Logically arrive at the essential aspects. 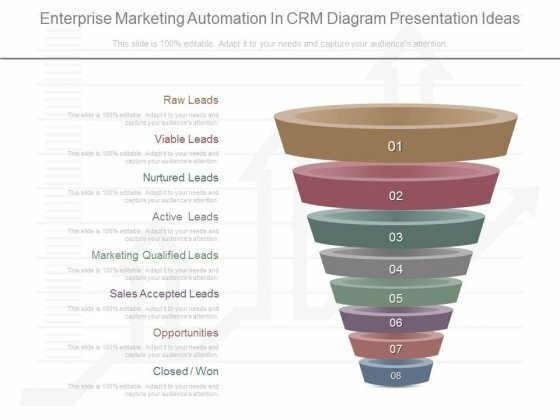 Discern the key factors with our Enterprise Marketing Automation In Crm Diagram Presentation Ideas. This is a example of sales lead management example of ppt. This is a eight stage process. 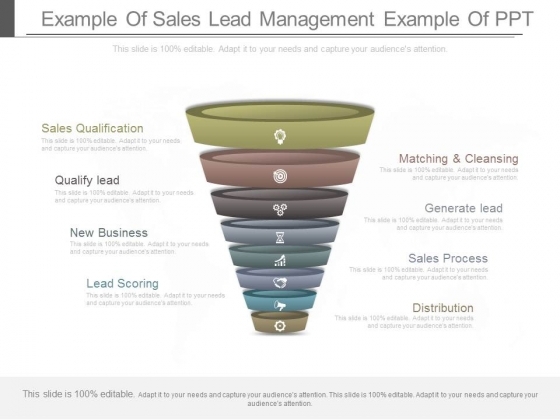 The stages in this process are sales qualification, qualify lead, new business, lead scoring, matching and cleansing, generate lead, sales process, distribution. Our Example Of Sales Lead Management Example Of Ppt are topically designed to impress. Use them to look like a presentation pro.